Now they say that they have lost hundreds of millions over the last few years. And they want to stick it to the rate payers. They want to keep this 45 year old plant open for 4 more years, charging rate payers up to $17,500,000 more per MONTH! This is covers their fines for Fraud, and make up for lost profits. Disgusting these pigs. 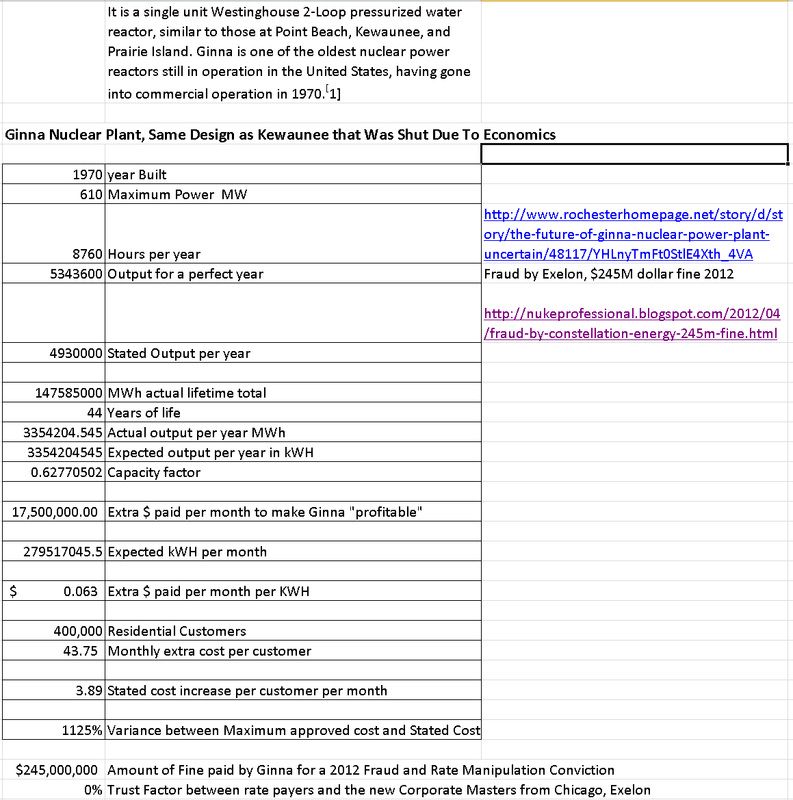 The latest calculations from the de-liar, the Nukepro, shows that their written submission could see them charging customers up to $43.75 extra per month, and keep in mind, these people have been convicted of fraud and rate rixing. So why would they not charge near maximum amount? Ginna states in the article linked here near the bottom, that the cost will be $3.89 per customer per month! But it could be $43.75, only 1125% more than their minimizations. As for a solution, Power says there won't be one anytime soon. Talks between all parties involved will likely go on behind closed doors for years. Meanwhile, Ginna continues to produce power but lose money. I see....don't worry, the cost will only be a little and it will be a long time from now. But remember, we warned you. Exelon / Ginna states that saving the plant will "protect critical tax revenue" for the region. hmmmmm, can that even pass the straight face test? The tax revenue is being paid by Ginna after it collects the money from the rate payers. Wouldn't it just be better if the rate payers just kept that money without it shuffling around and being chewed up in government inefficiency? The "transmission and distribution upgrades" in the Exelon statement refers to a separate plan that RG&E has proposed to limit the duration of surcharge payment. Exelon could choose to keep the plant in operation after that if market conditions warranted. Nukepro calculates that Exelon will be authorized to charge Ginna customers 6.3 cent per kWH more than they are charging now. See the spreadsheet below. Here they calculate that the rate payers would be extorted for $75M to $100M a year from these convicted fraudsters. If they cared about the ratepayer, could they not impliment Voltage Reduction (as described by fmr. Berkeley Prof. Doctor Bill Wattenburg? Quote: "Surprisingly, all modern appliances, air conditioners, and business equipment tested performed well at voltages down to 105 volts. The efficiency of all appliances and motors tested was better at 110 volts than at the standard 120 volts that most utilities supply to their customers. Most important of all, the equipment used less energy at lower voltages." It would seem to me that that "unnatural person" puts profit ahead of people. Seems like a good time to go off-grid, or at least going off-grid for lighting, before the next oil-price shock on the upward side. Quote: ... "if customers cannot pay immediately they certainly will when prices ‘recover’." Vote with your feet & Veto with your dollars, people! No time for in depth look, but lower voltage means higher amperage means higher losses, I squared R law. Idiot. Its VARS that count on the grid. You would know that if you spent time in the city btrol room as i had. SRO baby. Where is your operators license. Hey Turd were you trying to say you spent time in the city brothel? Auto correct control room. I actually provided clean cheap carbon free electricity to millions of Americans at the same time. Millions went about their day living their lives because of the dedication of people like me. I've paid my dues in this enterprise and now can help guide the next generation after me. The young people in nuclear are leaps and bounds above the rest. They sieze the day with innovation and hope for the future. The new paradigm is not to sit back and let antinukes and detractors frame the debate. We are taking the fight to you directly and if all you have is name calling and banning people from debate then you lose. There are more people getting nuclear engineering degrees now a day than before. This is because they know their services will be valued by society as they are right now. Ask if I would rather be on the inside doing it right, or on the outside only speculating and guessing, jumping to wild conclusuons. You get the drift. You went down the wrong road friend. No eorries . The planet is robust as are humans. We would not be here if there was zero radiation around us. We owe our very existence to atomic and nuclear reactions. Every element in the periodic table can be found in nature. Even plutonium. Hey here is a thought problem for you to ponder. Given that u238 fast fissions spontaneously at a specific rate and given the inventory of natural uranium in the ground and the absorption cross section for neutron capture can you calculate the natural production rate of plutonium in all the ore on earth? I bet when you get done with that calc you will find there is more plutonium being made by natural processes through spontaneous fission and subsequent neutron capture in the ground than in reactors. Hint there are many many subcritical Oklos in the world. Quote of Dr.Bill: "See Appendix IV of this report for the experimental data that verifies that large amounts of energy can be saved by lowering customer voltages below the standard 120+ volts. These easily reproduced experiments demonstrate the enormous amount of energy wasted by modern air conditioners operating at 240 volts. The test data presented in the report demonstrates that modern home air conditioners are most efficient at 210 volts. (The air conditioner experimental data was independently verified in 2005 by University of California, Davis, scientists working with the Sacramento Municipal Utility District -- SMUD.) "
... "This is the California Energy Commission (CEC) technical report filed by Dr. Bill Wattenburg in March 2005. The major California utilities had previously attempted to squash the main voltage reduction conclusions of this report in proceedings before the California Public Utilities Commission in 2001-2002. Then CEC staff members refused to publish this report for over a year. Among other things, they tried to do the handiwork for the utilities by insisting that the entire section on Voltage Reduction , Appendix IV, be removed because they claimed "it was not within the scope of the contract work. " The CEC finally published this report without change in June 2006 after they were challenged with legal action for attempting to falsify a scientific report which was paid for and is the property of the State of California. *Dr Willard H. (Bill) Wattenburg is a senior research scientist at the Research Foundation, California State University, Chico; and a scientific consultant for the University of California Lawrence Livermore National Laboratory and many other institutions. He is a former nuclear weapons designer at the Lawrence Livermore National Laboratory; a former member of the US Air Force Scientific Advisory Board; and a former UC Berkeley professor of electrical engineering. He is also the host of the very popular radio talk show, “The Open Line to the West Coast,” KGO Radio AM810, ABC Network, San Francisco ..."
... [from section titled "Explanation of the EXCEL graphs of voltage reduction and performance data:"] "Note that the power factor improves with voltage reduction as far down as 210 volts (105 volt equivalent) for motors and air conditioners." ... "The reason for this is that manufacturers still design almost all appliances, motors, and lighting to operate all over the world where voltages range 20% below the American standard of 120/240. When motors are designed for a particular voltage, say, 200 volts, they will typically operate less efficiently at unnecessarily higher voltages. And, contrary to the myths about high currents in motors run at lower voltages, the current increase is minimal when the voltage is dropped to the best power factor." ... "Since Power = V x I (cosine PF) for motors, the percentage current increase is limited to less than the percentage voltage decrease when the power factor increases with lowered voltage. Manufacturer's specifications show this (in small type). We questioned many major manufacturers who didn't want to discuss the test results. They know that their motors are being run at unnecessarily high voltages in the U.S. The fluorescent lighting manufacturers were the most reluctant, with a lot of arm waving about possible but unproven damage to their bulbs. In Graph 1, notice that 277 volt commercial fluorescents do quite well at 200 volts. It turns out that they sell the same bulbs for 220-240 systems as they do for 277 systems -- all over the world!" Quote: "Synthesized 'solar' jet fuel: Renewable kerosene from sunlight, water and carbon dioxide -- ScienceDaily"
x+(etc): Quote of RogerThat: "not batteries, but cheap methane"
Batteries AND cheap methane for 20below and colder Weather? Ha ha looks like Exelon won't shut down Ginna soon enough for you. Should get the good people of Western NY through a couple more winters and Bills football games. For every Buffalo Bills game you watch just remember the electricity produced so people can enjoy that nice standard of living is made possible by Gonna. Large baseload for large populations. Anything less is a drop in standard of living. The old baseload lie, how stale is that. Oh ya, thats Gonna work out just fine. Now we will see how the Ginnapigs get raped over by the law supporting Ginna. Gonna supports life and our standard of living. Turd, no nuclear steals from the future. and doesnt even make sense in the present. your precious is deadly. You can ban those that disagree, call them trills but in the end you lose. Real men face the fire. Real men don't go running to mommies maija or enenews. Real men shut down nuclear. The nukist will win some battles, but the light of truth shall win the war. Sorry for the misspellings. Autocorrect. Periodically I'll send some links to real analyses to counter your claims.